Failure to adequately maintain the San Diego-based littoral combat ship USS Fort Worth cost its commander his job, the Navy announced Monday. Cmdr. Michael Atwell, who headed the deployed vessel’s Crew 101, was relieved by Rear Adm. Charles Williams — commander of Task Force 73 — due to loss of confidence in Atwell’s ability to command, the Navy said in a statement. 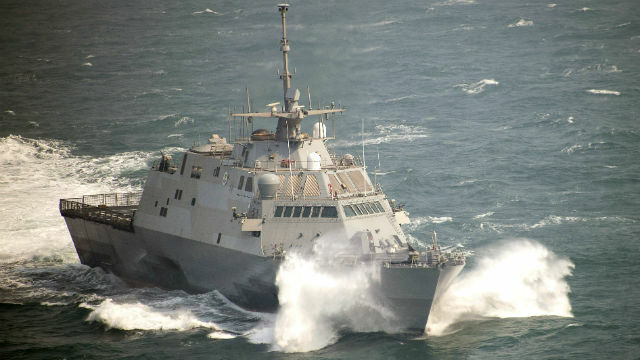 An LCS is staffed by multiple crews that rotate through four-month periods during deployments. The Fort Worth has been in Southeast Asia since late 2014. Atwell was temporarily reassigned to Littoral Combat Ship Squadron 1 in San Diego, and replaced for now by Cmdr. Lex Walker. A permanent commander will be assigned later. According to the U.S. Naval Institute, the Fort Worth’s propulsion system was reported damaged on Jan. 12. The damage involved its combining gear – – complex machinery that links the output of gas turbine and diesel engines, and directs the result to shafts that drive water jets. A Navy memo blamed a lack of lubrication for the damage, which has sidelined the vessel in Singapore. The Navy said an investigation is under review, but “sufficient findings of facts emerged during the investigation to warrant the relief of the commanding officer.” No decisions have been made on repair options, according to the Navy statement.